So much yarn, so little time. 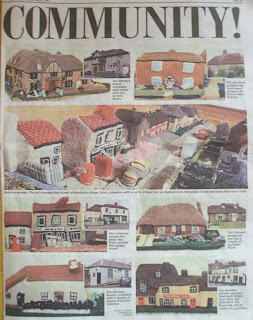 : Mersham Knitted village - oh my! 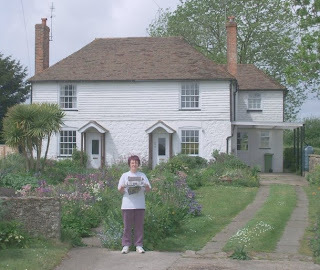 When I saw a piece about Mersham knitted village on the news and in the Press I blocked out Saturday 16th May in my diary. I knew I HAD to see this wonderful labour of love. I was not disappointed. It was fabulous. I'm sad that it's been split up, it really did deserve a place in a museum. 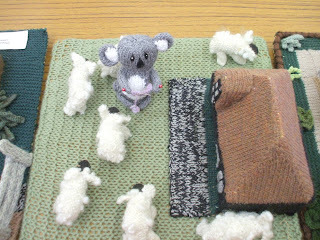 Many of the villagers were at the final exhibition, there to make sure that only they would snap up their own knitted house. 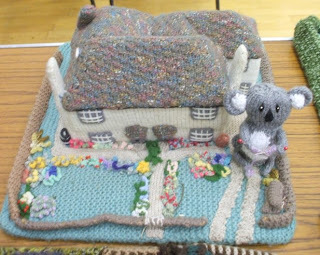 I was very cheeky and asked if I photograph my "knitting koala" in the various houses and gardens - I think she looks like she's knitting her own home! 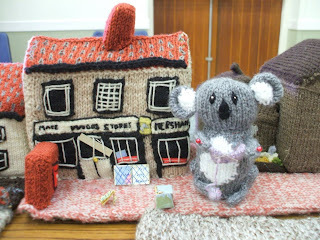 It began way back in 1986 when some of the ladies in the village Monday afternoon club decided to knit the village after seing an article in Women's Weekly about another village who had taken up their needles to knit their own homes. 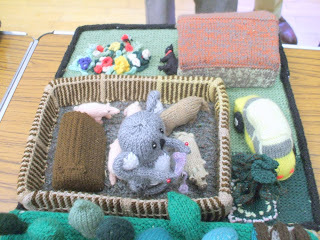 The knitted village was exhibited in various local fetes to raise money for the Village Hall - I'm told they've raised around £10,000. To my surprise (and secret delight) some houses went unclaimed - so I was able to make a donation to the Village Hall fund and take away "Long Row". Having bought my knitted house, of course the next task was to find the "real life" version - and here I am, proudly holding the knitted house with the real house as a backdrop. 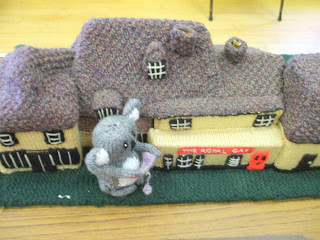 It is a shame such a lovely village was split up, but at least you benefited. I am looking forward to seeing your new house creations. Delightful. so glad you got to meet the ladies. And to own one of the houses, so sweet. I saw an article about this a while ago. Truly awesome! 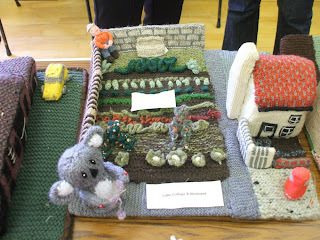 I had literally just found out about this knitted village through the Craftzine blog. How lucky that you got to see it AND buy one of the houses! Your house additions will be REALLY cool. I bet a lot of people will send you pics for special orders of their own homes. I would appreciate if a staff member here at niftyknits-somuchyarnsolittletime.blogspot.com could repost it. Seems ok to me, William, I've just checked the links. Sorry bren, if you read the post I said I bought the house, this isn't something I knit.